I have had these chairs for about 10 years. They were my Grandmother's and she gave them to me when she down sized. The seats were green and the fabric was tearing and tattered. I finally decided what to do. I found this Philip Jacob print in a heavy weight than quilting cotton. My dad cut new plywood and helped me redo the foam and fabric. I am very pleased how they turned out. Very bright and cheery. I have so much brown and tan in my house it is nice to add some colour. 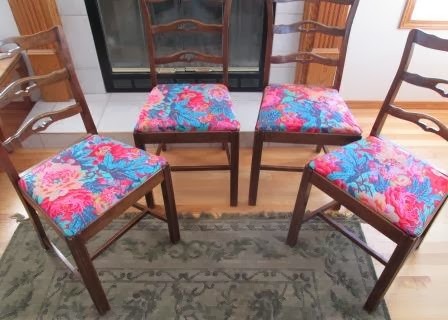 It took me so long to redo these chairs because I could not decide what to do. I did think I would make hooked wool rug seats. But I kind of gave up hooking. Then I did think I could do some patchwork and make a quilted cover. I just never got started. They are not square and I had trouble with that. Then I saw this fabric. I did not buy it at first but them went back and got enough to do the job. Thanks Dad for your help. 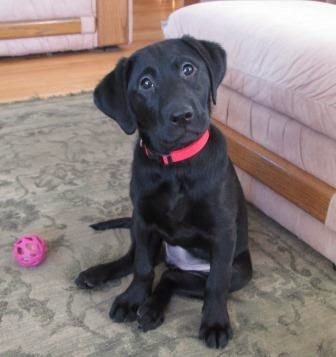 Cuteness overload, Gemma my new lab puppy. Gemma is such a cutie! 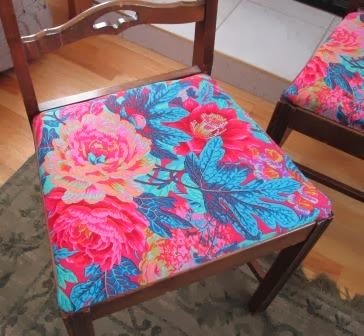 I love your chair seat fabric. Now that looks like spring! excellent re-do on the chairs and that puppy is TOO cute! I love your colorful new chairs! Also your puppy is super cute!! What a fantastic choice for these chairs... you'll have a Philip Jacob garden in your home all year long! And Gemma is adorable!